Polar Alignment is discussed on this page in much greater detail. If you want to know more about this topic, read on - You'll probably find more here than you need on the subject! "Polar Alignment Is Easy ... Really! Using the "Star Drift" Method"
Adapted From Celestron's "How to Polar Align Your Telescope"
If you’re like most new amateur astronomers, the first thing you probably do when you get your new telescope properly assembled is put in an eyepiece and point it up to look at the moon. Just the excitement of seeing the lunar landscape up close is enough to keep you entertained for days. But eventually, as you progress to finding more difficult objects, such as planets and faint deep-sky objects, you will want to utilize all the features of your equatorial mount, such as the setting circles or perhaps even a motor drive. A mount is said to be "equatorial" if one of its two axes can be made parallel with the Earth’s axis of rotation. Aligning the telescope to the Earth's axis can be a simple or rather involved procedure depending on the level of precision needed for what you want to do. For casual observing, only a rough polar alignment is needed. Better alignment is needed for tracking objects across the sky (either manually or with a motor drive) at high magnifications. Still greater precision is needed in order to use setting circles to locate those hard-to-find objects. Finally, astrophotography will require the most accurate polar alignment of all. out simply by turning the axis (either by hand or with a motor drive) at the same rate as the rotation of the Earth, but in the opposite direction. Although residents of the northern hemisphere are convenienced with a bright star (Polaris) less than a degree from Earth’s rotational axis, the NCP can still be a somewhat elusive place to locate. The North Celestial Pole (NCP) is the point in the sky around which all the stars appear to rotate. The star Polaris lies less than a degree from the NCP and it can be used to roughly polar align a telescope. However, for accurate polar alignment, the polar axis of the telescope's mount needs to be aligned to the true NCP. By matching the latitude angle of the telescope mount with the latitude of your observing site, you can easily approximate the position of the North Celestial Pole (NCP). For ordinary visual observing, the telescope’s polar axis must be aligned to the Earth's pole. This simply means positioning the telescope so that the polar axis is aimed up at Polaris. The easiest way to accomplish this is to rotate the telescope tube to read 90° in declination. In this position the telescope will be parallel to the polar axis. Now, move the telescope, tripod and all, until the polar axis and telescope tube are pointed towards Polaris. Finally, match the angle of your telescope’s polar axis to the latitude of your observing location. Most telescopes have a latitude scale on the side of the mount that tells you how far to angle the mount for a given latitude (see your telescope owner's manual for instructions on how to make this adjustment). This adjustment determines how high the polar axis will point above the horizon. For example, if you live at 40° latitude, the position of Polaris will be 40° above the northern horizon. Remember your latitude measurement need only be approximate; in order to change your latitude by 1° you would have to move your observing position by 70 miles! Polaris should now be in the field of view of an aligned finderscope. Continue making minor adjustments in latitude and azimuth (side to side), centering Polaris in the finder’s cross hairs or low power eyepiece. This is all that is required for a polar alignment good enough to use your telescope’s slow motion controls to easily track a star or planet across the sky. However, in order to take full advantage of the many features of your telescope (such as setting circle and astrophotography capability) a more precise polar alignment will be necessary. Before we can be certain that the telescope's polar axis is accurately aligned with the rotational axis of the Earth, we must first be certain that the finderscope (which will actually be used to polar align the mount) is aligned with the telescope's polar axis. Set up your mount as you would for polar alignment. The DEC setting circle should read 90°. Rotate the telescope in Right Ascension so that the finderscope is positioned on the side of the telescope tube. Adjust the mount in altitude and azimuth until Polaris is in the field of view of the finder and centered in the cross hairs. Now, while looking through the finderscope, slowly rotate the telescope 180° around the polar axis (i.e. 12 hours in Right Ascension) until the finder is on the opposite side of the telescope. If the optical axis of the finder is parallel to the polar axis of the mount, then Polaris will not have moved, but remain centered in the cross hairs. If, on the other hand, Polaris has moved off of the cross hairs, then the optical axis of the finder is skewed slightly from the polar axis of the mount. If this is the case, you will notice that Polaris will scribe a semi-circle around the point where the polar axis is pointing. Take notice how far and in what direction Polaris has moved. Even with the telescope positioned 180º around the mount, the telescope (and finderscope) should still be pointing at the same object in the sky. Using the screws on the finder bracket, make adjustments to the finderscope and move the cross hairs halfway towards Polaris’ current position (indicated by the "X" in Figure B below). Once this is done, adjust the mount itself in altitude and azimuth so that Polaris is once again centered in the cross hairs. Repeat the process by rotating the mount back 180° , and adjusting the finder bracket screws until the cross hairs are halfway between their current position and where Polaris is located, and then centering Polaris in the cross hairs by adjusting the mount in altitude and azimuth. With each successive adjustment the distance that Polaris moves away from center will decrease. Continue this process' until Polaris remains stationary in the cross hairs when the mount is rotated 180º. When this is done, the optical axis of the finderscope is perfectly aligned with the polar axis of the mount. Now the finder can be used to polar align the mount. When rotating the finderscope 180º around the polar axis , the cross hairs will rotate around the point which the polar axis is pointing (indicated by the "X" in Figure B). Adjusting the finderscope and the equatorial mount until an object remains centered in the cross hairs indicates that the finderscope is aligned with the telescope's polar axis. So far we have accomplished aligning the polar axis of the telescope with the North Star (Polaris), but as any star atlas will reveal, the true North Celestial Pole (NCP) lies about 3/4° away from Polaris, towards the last star in the Big Dipper (Alkaid). To make this final adjustment, the telescope mount (not the telescope tube) will also need to be moved away from Polaris towards the actual NCP. But the question is; since Polaris makes a complete rotation around the Celestial Pole once a day, how far should the mount be moved and in what direction? Let's take an example: suppose you are out observing on August 1st at 8:00 p.m.. A quick inspection of the northern sky will reveal that the last star in the handle of the Big Dipper, Alkaid, lies above and to the left of Polaris in the 10 o’clock position. Now, while looking through the finderscope (with Polaris still centered in the cross hairs) adjust the latitude and azimuth of the mount up and to the left until Polaris also moves up and to the left in your straight through finderscope. (Remember a straight through finder inverts the image, so Polaris will appear to move in the same direction as the mount is moved). How far to move Polaris will depend on the field of view of the finderscope. If using a finderscope with a 6° field of view, Polaris should be offset approximately 1/3 of the way from center to edge in the finder’s view (i.e. half of the field of view, from center to edge, equals 3° and 1/3 of that equals 1°). This calculation can be approximated for any finderscope with a known field of view. The true North Celestial Pole (NCP) lies less than a degree away from Polaris in the direction of the last star in the handle of the Big Dipper (Ursa Major). The mount’s setting circles can now be used to determine just how close the polar axis is to the NCP. First, aim the telescope tube (be careful not to move the mount or tripod legs) at a bright star of known right ascension near the celestial equator. Turn the right ascension setting circle to match that of the bright star. Now, rotate the telescope tube until it reads 2 hours 30 minutes (the right ascension of Polaris) and +89¼° declination. Polaris should fall in the center of the finder's cross hairs. If it doesn’t, once again move the mount in latitude and azimuth to center Polaris. This procedure aligns the telescope mount to within a fraction of a degree of the NCP; good enough to track a star or planet in a medium power eyepiece without any noticeable drift. However, long exposure astrophotography is far less forgiving and film will easily reveal even the smallest amount of motion. At this point, you may be wondering why bother polar aligning any more accurately if you can use the slow motion controls or drive corrector to keep a guide star centered in the cross hairs of an eyepiece. Unfortunately, keeping the guide star centered in the cross hairs is only half the battle. Since, the polar axis is not perfectly in line with the Earth’s axis, the stars in the field of view will slowly rotate as you guide. You will get a sharp image of the guide star, but the other stars on the photograph will appear to rotate around the guide star. This is also why you cannot accurately do guided photography with an Altitude-Azimuth (Altazimuth) style mount. The above method of polar alignment is limited by the accuracy of your telescope's setting circles and how well the telescope is aligned with the mount. The following method of polar alignment is independent of these factors and should only be undertaken if long-exposure, guided photography is your ultimate goal. The declination drift method requires that you monitor the drift of selected stars. The drift of each star tells you how far away the polar axis is pointing from the true celestial pole and in what direction. Although declination drift is simple and straight-forward, it requires a great deal of time and patience to complete when first attempted. The declination drift method should be done after the previously mentioned polar alignment steps have been completed. To perform the declination drift method, you need to choose two bright stars. One should be near the eastern horizon and one due south near the meridian. Both stars should be near the celestial equator (i.e., 0° declination). You will monitor the drift of each star one at a time and in declination only. While monitoring a star on the meridian, any misalignment in the east-west direction is revealed. While monitoring a star near the east horizon, any misalignment in the north-south direction is revealed. As for hardware, you will need an illuminated reticle ocular to help you recognize any drift. For very close alignment, a Barlow lens is also recommended since it increases the magnification and reveals any drift faster. When looking due south, insert the diagonal so the eyepiece points straight up. Insert the cross hair ocular and rotate the cross hairs so that one is parallel to the declination axis and the other is parallel to the right ascension axis. Move your telescope manually in R.A. and DEC to check parallelism. First, choose your star near where the celestial equator (i.e. at or about 0º in declination) and the meridian meet. The star should be approximately 1/2 hour of right ascension from the meridian and within five degrees in declination of the celestial equator. Center the star in the field of your telescope and monitor the drift in declination. If the star drifts south, the polar axis is too far east. If the star drifts north, the polar axis is too far west. Using the telescope's azimuth adjustment knobs, make the appropriate adjustments to the polar axis to eliminate any drift. Once you have eliminated all the drift, move to the star near the eastern horizon. The star should be 20 degrees above the horizon and within five degrees of the celestial equator. If the star drifts south, the polar axis is too low. If the star drifts north, the polar axis is too high. This time, make the appropriate adjustments to the polar axis in altitude to eliminate any drift. Unfortunately, the latter adjustments interact with the prior adjustments ever so slightly. So, repeat the process again to improve the accuracy, checking both axes for minimal drift. Once the drift has been eliminated, the telescope is very accurately aligned. You can now do prime focus deep-sky astrophotography for long periods. If the eastern horizon is blocked, you may choose a star near the western horizon, but you must reverse the polar high/low error directions. Also, if using this method in the southern hemisphere, the direction of drift is reversed for both R.A. and DEC. Even with a telescope with a clock drive and a nearly perfect alignment, most beginners are surprised to find out that manual guiding may still be needed to achieve pinpoint star images in photographs. Unfortunately, there are uncontrollable factors such as periodic error in the drive gears, flexure of the telescope tube and mount as the telescope changes positions in the sky, and atmospheric refraction that will slightly alter the apparent position of any object. Polar alignment, as performed by many amateurs, can be very time consuming if you spend a lot of time getting it more precise than is needed for what you intended to do with the telescope. As one becomes more experienced with practice, the polar alignment process will become second nature and will take only a fraction of the time as it did the first time. But remember that when setting up your telescope's equatorial mount, you only need to align it well enough to do the job you want. Polar Alignment Is Easy ... Really! In the following article, differing directions for the southern hemisphere are indicated by braces [example]. If you have an equatorial telescope, you may have experienced the pain of tracking error. If you plan on doing long exposure astrophotography, you must be accurately aligned on the north [or south] celestial pole. Having a drive corrector isn't enough. Even if you keep a star right on the crosshair in your reticle, if the mount isn't polar aligned you'll get some error from field rotation. Polar finder scopes are useful tools and will get you very close to the mark but imagine having your scope track "dead on" with no declination corrections for 10 to 20 minutes! If you have period error correction (PEC) you'll be free from right ascension corrections as well. Polar alignment by the "star drift" method takes more time than using a polar scope, but a simple procedure using two stars will get your mount RIGHT ON the celestial pole. It's a simple method that does not require setting circles or the knowledge of date and time. Another valuable aspect of the two star method is that Polaris [or the south pole] need NOT be visible while aligning. Start by doing a quick and dirty eye-ball polar alignment. The closer this initial alignment is, the faster you will complete the task. Point the telescope at a star close to the celestial equator and near the eastern horizon. Not too close to the horizon now ... you don't want diffraction entering the equation. Track on the star and make corrections in right ascension only, don't correct in declination yet. Watch the star drift. An illuminated reticle makes this a lot easier. If the star drifts south [north] in the field of view, then the polar axis is too low (pointed below the pole—toward the horizon). If the star drifts north [south], the axis is too high (pointed above the pole—toward zenith). Make your adjustments to the altitude of the polar axis until the drift becomes negligible. Now go to a star near the celestial equator again but this time near the meridian. Guide only in right ascension as before. If the star drifts south, then the polar axis is pointing east [west] of north [south]. If it drifts north, then the axis is west [east] of north [south]. This time adjust the azimuth of the mount until the declination drift goes away. Do this a few more times until there's no drift in declination from stars near the horizon and meridian. There's an even easier way to remember which direction to adjust. Forget all about north and south in the eyepiece. Just remember that it's the altitude and azimuth of the mount that you are adjusting. Astrophotographer Barry Gordon calls it the "altitudE is Easy and aziMuth is Mad" method. The altitude adjustment is easy to remember ... adjust it so the star moves back towards the center of the field. The azimuth adjustment is maddening because you move the star further away from the center, in the direction it's drifting. It really is that simple—it just takes longer than any of the other methods. But if you are taking shots over ten minutes in length, it gets pretty boring constantly staring into an eyepiece. Wouldn't you rather look every minute or two and make a tiny tweak rather than being hunched over with your eyes straining and watering? (The following was written by astro-tom to explain some of the missing links in polar alignment not explained on any other website. Remember, the goal of this site is for you to have your questions about amateur astronomy answered, so if this is still unclear, let me know! I just bought a Celestron CG4 german equitorial mount and a Celestron C90 MAK (just for fun) to test my luck on this hobby. I was hoping if I liked all this, I would buy a larger scope later. There are some problems I knew I would have, like lack of space and then, I cannot see Polaris from my patio; but that could be worked around. I could do a rough alignment without actually looking at Polaris, I think. And I have followed procedure to that many times this week. My big problem (CG4 mount arrived 4 days ago) is to understand how to move, work with the setup after the alignment. I have no idea (I have a dual tracking motors system) and you are my last attempt to overcome this obstacle. Yes, I am frustrated and angry that I have gone so far ahead of myself knowing so little. Once I polar align, how do I move to the area of the sky I want to see? What parts of the mount do I move, which I parts are ones that I shouldn't move and leave alone? I am afraid to touch anything that may disrupt the alignment . In fact, I do not understand how I can position my telescope looking let's say at Jupiter, after I set everything to point at Polaris. In my mind, any thing I move will disrupt any setup done during alignment. I just cannot visualize this. I had similar questions when I was starting in amateur astronomy, and I can completely relate to your sense of frustration. So we're both talking about the same things, I have attached picture of the Celestron CG4 mount that I'd like to refer to in the text. My recommendation for you (to get the hang of all of this) is to take your telescope to a safe, dark location where you can actually see Polaris the first few times you do this - at least until you feel comfortable with Polar Alignment and what I'm writing below starts to make intuitive sense. You should be able to picture this in your mind eventually and why it works. Then you can take it back to your patio and we'll get into another form of polar alignment that does not rely on Polaris to align the scope. There are two phases in the process. The first phase is orienting the tripod and mount physically, correctly, aligning them with Polaris. The second phase is moving only the telescope (but *not* the tripod or the changing the polar alignment axis). In this phase the telescope is only moved by releasing either the Right Ascension (RA) clutch or the Declination (Dec) clutch. The important thing to understand is that after the tripod and mount are aligned, you do NOT move them, only the rotation of the telescope about the RA or Dec axes. 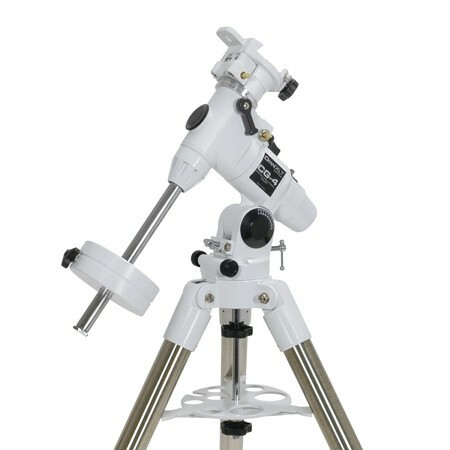 The counterbalance weights will move as you rotate the telescope about the RA axis of course, but you will not pick up the tripod to see a new star or you will not adjust the latitude adjustment (the joint below the Right Ascension axis. The last part of Phase 1 is to mount your telescope in the right direction on the Dec plate, seen on the photo at the top of the mount with a black knob on the right hand side. This may seem silly to mention, but I mounted my telescope exactly backwards the first couple of times and was utterly frustrated why I couldn't get the stars to track correctly and couldn't even get the mount to point at portions of the sky! When the mount is as it is in the photo, your telescope should be pointed up and to the left. In fact, if the mounting plate is aligned just like it is in the photo, and the RA axis is aligned to Polaris, you should be able to look through your telescope with a low power eyepiece and see Polaris too, almost the same as your RA alignment scope. Now that your scope is aligned roughly and the telescope is mounted pointing in the right direction, provide power and turn on the motor tracking drive. Phase 2: From this point on, only use the black clutch levers of the CG4 mount to move the telescope in RA or Dec.!! You'll find that there is almost always a combination of RA and Dec positions of the CG4 that will bring objects into view for the telescope. You only move the telescope by releasing and re-engaging the clutch levers on the two axes, the RA and Dec". ..just don't pick up the scope/tripod assembly to repoint the telescope, move the scope only. Doing so will immediately ruin your polar alignment. Once the object is centered in the scope and the RA tracking is on, you'll find that the object will stay in the field of view at low power for minutes before it has to be re-centered. With a precision polar alignment, it can stay centered for tens of minutes or even hours if the alignment is exceptional. I believe that taking your telescope to a location where you can see Polaris and picture how this will all work once you get back to your patio will make a huge difference to you. If you leave your telescope setup on the mount and just carry it from the house out to your patio, I recommend taking a small paint brush and some white paint and paint little white circles around the base of the tripod legs onto the patio, marking right where to place your telescope for a rough polar alignment the next time you go out. This can be a real time saver. I recommend the book "Nightwatch" as absolutely the best introductory book to amateur astronomy. It's loaded with tips about polar alignment, other equipment that is a must have and talks about which pieces of equipment are just "nice to haves". It also has information about constellations, Messier objects and much more. I'm obviously a fan. I also recommend that you do a search for astronomy clubs in your area. There are likely a few within driving distance. Go to a meeting and find out when the next "Star Party" is going to be, then dress warm, pack up your telescope, power supply and eyepieces and go hang out for the evening with highly knowledgeable fellow amateur astronomers. You'll learn tons from these great people. They'll let you look through their telescopes and you can have them assist you setting up your own. There's nothing better than watching someone actually do something to learn how to do it!